Our product range includes a wide range of almen strips. Almen Strips are classified into 3 types: 'A', 'N', and 'C'. They differ in their thickness, while they have the same width and length. Almen strip of "A" type is predominantly used for shot peening with cast shot or cut wire shot. "N" type strips are used usually for glass bead peen and ceramic bead peen. 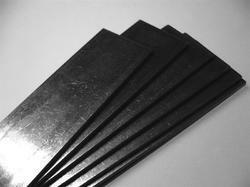 "C" type almen strips are used more rarely and are thicker than the other types. Although similar, the specification for Almen strip dimensions of the same type slightly vary from one company/organization to another.